The tech industry’s drastic lack of gender, ethnic, and racial diversity impacts company culture, the diversity of ideas, and profitability. But companies that are more diverse are more profitable and successful. Companies in the top quarter for racial and ethnic diversity are 35% more likely to have better financial returns than competitors in their industry and companies in the top quarter for gender diversity are 15% more likely to have better financial returns, according to a 2015 McKinsey study. So how can we ensure that there is more diversity in tech? A focus on hiring diverse employees is a good start — but it’s not the only answer. Rethink Impact Founder and Managing Director Jenny Abramson, Black Girls Code Founder and CEO Kimberly Bryant, and Cornell Tech Jack and Rilla Neafsey Dean and Vice Provost Dan Huttenlocher shared a multifaceted approach to shifting the statistic in a conversation moderated by Bloomberg’s Scarlet Fu at Bloomberg Live’s Sooner Than You Think conference held at Cornell Tech last month. 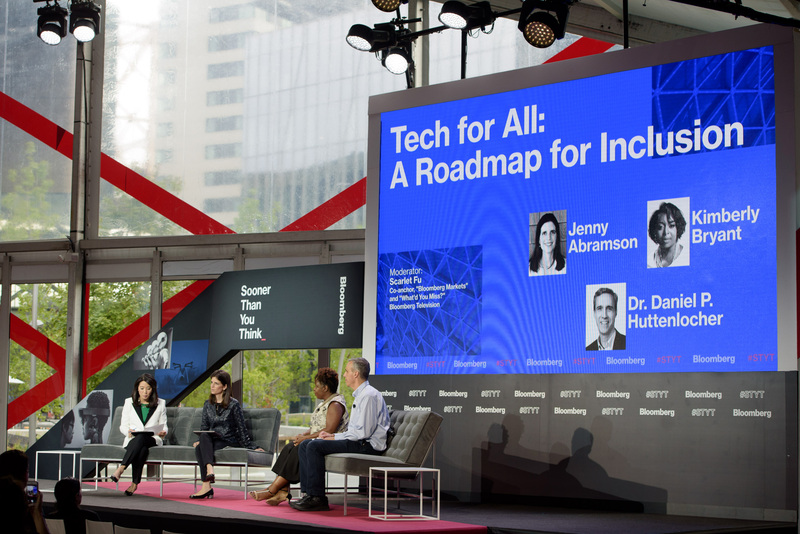 Cornell Tech focuses on diversity on all levels of the pipeline, Huttenlocher said, noting the campus’ K-12 Initiative to teach tech skills to New York City public school students and the WiTNY (Women in Technology and Entrepreneurship in NY) initiative to support incoming freshman and current women at The City University of New York who are interested in pursuing tech and entrepreneurship. “As you move further and further up the pipeline, you get a lower and lower percentage of participation of diverse people. You can’t attack it at any one level; you need to look at all these levels in parallel,” Huttenlocher said. “We have this issue of a leaky pipeline, so to speak,” said Bryant, explaining that despite recruiting diverse talent, companies aren’t retaining diverse team members and they advance to leadership positions far less often than their more homogeneous counterparts. “All of these issues are impacting this inertia that is not moving the needle,” Bryant explained. Businesses should focus on creating a supportive corporate culture that enables all people to advance. In addition to teaching technology skills, Black Girls Code teaches young women the diverse skills they’ll need to thrive in their careers and hopefully fix the leaky pipeline. “We are looking at leadership development, collaboration skills, and team building, because we know that [students] will need a diversity of things in their toolkit to really be successful in the industry,” Bryant explained. “The more diversity you have, whether it’s ethnic, racial, or gender, the better financial returns you’ll have,” said Abramson. To illustrate, she explained that companies in the top quartile for racial and ethnic diversity are 30% more likely to perform above the mean in their industry. Similarly companies that go from zero to a 30% female leadership team have a 15% increase in net revenue. Data shows the results are there, “but not enough people know it at this point,” she said adding that currently only 2.19% of all venture capital funding goes to women. One way to increase funding is to increase the number of diverse venture capitalists, Abramson explained, noting a recent Harvard University study that tracked venture capitalists’ conversations with male and female founders. The conversations about male founders were generally more positive than the ones about female founders. “I think what it tells you is that there are some serious unconscious biases there and it’s why it is so critical to have people of diverse backgrounds at every stage of investing so that these natural inclinations can be dealt with,” Abramson said.